Skipped Day 25, just needed a break. Day 26 was an unhappy day. 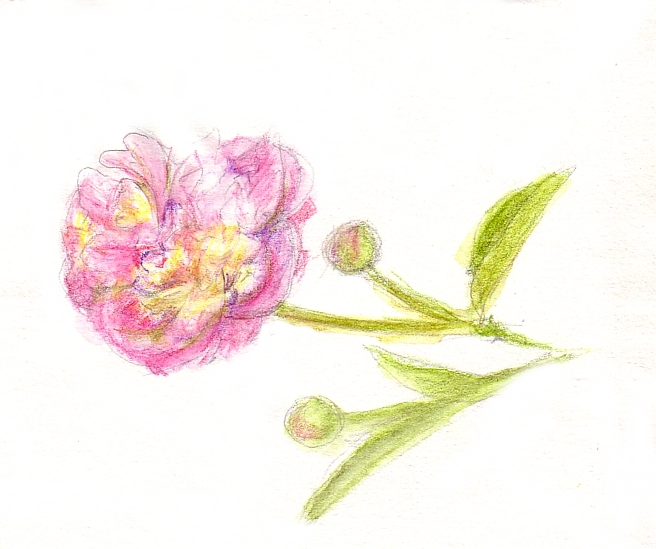 I spend much time trying to draw the peonies that just bloomed in my front yard. This is the best of the poor sketches in my sketchbook, how sad. But you know, sometimes it just doesn’t gel. I often have to remind myself that even if a drawing doesn’t turn out the way I want, I probably gained something from it. Someday I will draw a flower that I am proud of and it will be the result of many sketches like this one. Good for you for posting it even though you are not happy with it. I have posted lots of stuff for this project that normally wouldn’t have seen the light of day! But I think that’s part of the point, to do something every day, good or bad, then move on. There is learning in that process even if the product is what we want. And just like you said, sooner of later, you will have a drawing of this flower that you are happy with. I think there is something very soft and delicate about this flower that is really very nice! Thanks Ann. I’m glad you see something to like in this drawing. Thanks for stopping by. I know we are all busy drawing and posting! i love your work and even this one which you don’t particularly like looks good to me. i like the soft and fluid lines which make the petals look as if they’re fluttering in a breeze.